Your residence consists of a roof and various other building structures. You most likely pay so little attention to the roof. This is unless something drastic happens to your home and the roof in particular. You would then start hunting for a professional to have a glaring problem fixed. There are so many types of roofing professionals practicing out there. In addition, their services come with varying cost structures. With this in mind, some issues require consideration before you can venture out to hire a roofing contractor practicing in Grand Rapids, MI. With these considerations, you will have an opportunity to counter any, arising challenges before they occur. If you detect water leaking from your roof, something is seriously wrong. Do not, therefore, wait any longer before calling for help. Waiting will mean further damage is bound to occur, leading to additional costs for remedies. After a major storm, engage a roofing specialist to undertake a consultative inspection. This will only take a short while, and the proficient expert will give you a presentation. This will inform you about how to go about seeking damages reparations from your insurance cover provider. In a normal situation, an insurance package will cover replacing your roof with a new one should this become necessary. There are many types of roofs available. A roofing contractor may be more specialized in certain kinds of roofing and may do a good job on one type and a poor job of another type. In addition, several of the options available fall outside what insurance companies will not compensate for should damage take place. In that regard, you need to consult a proficient roofing specialist who will guide you through picking a roof that will have insurance cover. The common roofing types include traditional and non-traditional types. Traditionally, shingles roofing types take top positions as favorites among more than ninety percent of property owners. Shingles normally have lifespans lasting as long as twenty years and come cheap compared to other types. They are also easy to make repairs on, and a single shingle can be fixed. This type of roofing has contractors specializing in their repairs and maintenance. Non-traditional types of shingles are manufactured from diverse materials. They are however much more expensive than traditional models. Non-traditional roofing types have wood, plastic and various mixtures and hybrid materials as their base. This makes them more expensive, although they bring additional positive attributes to buildings they roof. Until very recently, many property owners stayed away from roofing made of metal. This is irrespective of cost savings they could bring to an owner over time. Metal roofs see more preference in rural settings, although some city residences sometimes go for them. Metal roofing is comparatively cheaper and lasts much longer when compared to traditional or other roof types. Their major disadvantage lies in the noise they make during bouts of heavy rainfall. A significant factor that you need to consider when hiring a roofing contractor is neighborhood homeowners’ association conditions. You probably inhabit an area with certain restrictions, where one has to seek clarification from the resident association. Among the conditions they insist on upholding, would probably include roofing. In this regard, you need to consult a roofing contractor familiar with prevailing homeowner association rules and regulations. With the help of such a contractor, you will pick a roofing structure from among those allowed. That way, there will be no stiff challenges in obtaining approval for your choice of slating from a local association. Should you do otherwise and pick a choice radically different you remain liable to stiff penalties. These include incurring additional costs for changing your roofing to one approved. It would be prudent to look up membership requirements and the type of professionals recommended by members. This would enable you to avoid replacement costs for options rejected. How long do you intend to live in your house? You probably do not expect to live on your current property forever. If your plan is a residency shorter than fifteen years, you ought to consider your choice of roofing. Think ahead and pick an option your potential buyer would be comfortable buying from you. 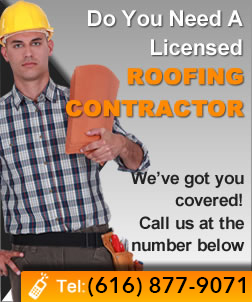 A good rule would be to consult a roofing contractor with vast experience and networking connections in your area. Such contractors have realtor business associates who would advise them on prospective property buyers and their preferred choices. Finally, ensure your chosen contractor has requisite certification. These should come from Federal and Michigan State regulatory agencies. Peer organizations within this industry must also certify your pick as fit to practice. Every certificate must be current to show this contractor adheres to current standards and gets inspected regularly. This way, property owners have lower risks of hiring contractors who accentuate rather than fix roofing issues.